Labour leader Ed Miliband is to accuse some property developers of hoarding land and failing to build the homes that the country needs. In a speech on Saturday, he will say too many firms with planning permission for projects are "sitting on land" as it gains value, instead of using it. Labour is considering giving councils more powers to penalise firms which do not proceed with building projects. The government said confiscating land "will not help build a single house". If it regains power in 2015, Labour is considering giving local authorities in England "use-it-or-lose-it" powers over developers, including introducing fees or buying back undeveloped land. Mr Miliband will use his speech to Labour's National Policy Forum to say planning permission has been granted for 400,000 homes in England that have not been built. Too many developers are holding on to land while it gains value rather than pushing ahead with projects for which they have permission, he will argue, and such "obstacles to housebuilding" must be overcome. 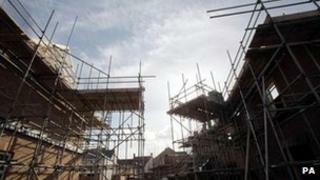 Labour wants to see an increase in housebuilding. But the party's strategists know, in an age of austerity - and as they battle to restore economic credibility - that they can't commit a future government to spending large sums of money to boost the construction industry. So they're exploring other ways of encouraging new developments to take place. They say planning permission has been granted by local authorities in England for 400,000 new homes - but developers have yet to build them. Ed Miliband believes some property firms and construction companies are hoarding land in the expectation that its value will rise. So, he will say a future Labour government would consider giving new powers to local authorities to penalise companies which acquire land for housing then fail to develop it. They could face fees, or the local council ultimately buy the land back from them. Currently local authorities have limited powers of compulsory purchase but have to prove that it would clearly be in the public interest to exercise them. "Across our country, there are firms sitting on land, waiting for it to accumulate in value and not building on it. Landowners with planning permission, who simply will not build. We have to change that," he will say. "All options should be on the table, including giving local authorities real power to say to the worst offenders that they should either use the land, or lose the land. "Permission to build should mean landowners build. If there is unnecessary hoarding, developers should be encouraged to do what they are in business to do, build houses." The Labour leader will admit that governments over the past few decades, including the last Labour administration in which he was a Cabinet minister, have failed to deal with the issue of housing shortages. But Planning Minister Nick Boles said Labour's policy was "incoherent". "Most normal planning permissions already expire after a three-year period and councils don't have to renew them," he said. "Labour clearly learnt nothing from its failures in government as 400,000 homes represents less than two years' worth of the number of new homes that we need to build. And confiscating any land from development will not help build a single house."